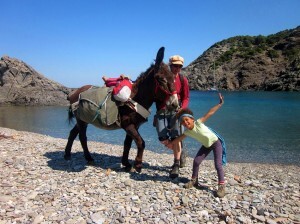 Hiking liberates both body and mind – Hiking with donkeys does more: it gives us a special feeling of harmony between man and animal, the harmonious experience of a wonderful landscape that is characterized by all its facets: the sea, the mountains and the beautiful countryside: Catalonia! 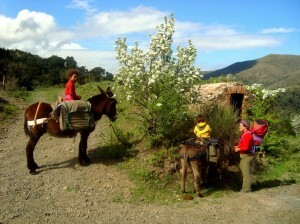 Thus, walking with donkeys is a special experience for everyone, whether big or small, whether in groups or alone. Step by step we will find – thanks to the leisurely donkey pace – ease of mind, while we take on the charms of a beautiful landscape and discover all the fascinating facets that make up this region. Our donkey hikes last from half a day to a week. Side by side with the friendly gray animal our paths lead through the jewel of Catalonia, the old Empordà. Free and unencumbered, because our luggage is probably stowed on the donkey’s back. The paths are deliberately chosen so that children – even if their legs are tired – can easily continue their way on a donkey. A carefree time in the midst of nature, far from everyday stress and tourist bustle: donkey walks through the old Empordà are very relaxing and an enjoyment for all ages. Our multi-day donkey trekking tours lead you along historical paths in the romantic wilderness of the Pyrenees and Costa Brava. The walks take us to the peaks of the Pyrenees foothills and past half-forgotten valleys. Peaceful tranquility and unspoiled scenery put us in a special world and allow us to find ourselves. Our sure-footed donkey carries our luggage and accompanies us as a friendly companion on our adventure trip. With our lovable donkeys as friendly and gentle hiking companions, the children can easily be motivated for hiking, and spending the night in tents under the bright starry sky makes the experience an adventure!